You may have noticed that this edition of "Weekend Fun" is starting a little early. That's because this weekend is PACKED full of fun events, starting as early as this Thursday! As usual, click on any event flyer/image to be taken to their site. Events with the "Get Inspired:" notification are not Arts&Craft shows, but are events aimed at helping you inspire and hone those creative juices. "Get crafty with a gallery tour featuring artworks that are invigorating, interesting, and inspiring for crafting. Crafters of all media are welcome, and refreshments will be provided after the tour. Be sure to send images of your finished project inspired by this program to webmaster@cartermuseum.org. The submitted images will be displayed on the Carter’s Facebook page." "Live art class every Monday night at the Mellow Mushroom. We have a live model and an MC to guide the time. There is a warm up model and a main stage model. It is creative figure sketching, though all mediums are welcomed and encouraged." "The Main St. Fort Worth Arts Festival showcases a juried art fair, savory food, live concerts, performance artists and street performers!" "This festival will be a full weekend of fun, art, music, food, and shopping, capped off with a touch of community pride. And don't forget to take the ultimate joy ride- we have 3 pedicabs coming in for the weekend! We'll be highlighting the murals that are going up along 7th Street, and what better way to see them than by bike?" "More than 60 vendors from Austin, Houston, and Dallas are setting up shop in tents all around Bishop Arts District. The amazing handmade wares range from home décor to jewelry. Live music and food are also part of the fun." "A juried exhibition, Arts, Music fest, food, drinks, and fun! A must stop on the Art Crawl!" "A campy al fresco market chockful of iron works, arts, and vintage furniture. Select Local Shops West of Inwood on West Lovers Lane are participating. Free Franks and drinks at noon (at Junkadoodle's)! Click for a full list. "This year's local artists include: Eliza Epstein, Jessica Sharp, Ruth Semmi, Kurtis Stubblefield, Peggy Martin, Lois Wisseman, and Cassie Whitmire." 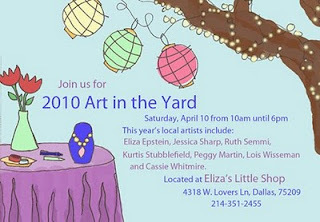 This market will include work from Found Images, Around the Bend Willow Furniture, and Dakota Pratt! "A re-created 16th Century English Village with 21 stages of entertainment, over 200 shoppes with unique handmade merchandise, games of skill, human powered rides, and a wide variety of food and beverage." "The show will have at least 100 vendors and many will be the same vendors who participated in the winter show. There will be everything from specialty T-shirts to jewelry and handmade items." Whew! This weekend has some serious Arts&Crafts potential! Good luck to all those many, many vendors that will be set up! I hope you have beautiful weather, good sales, and, most importantly, lots of fun! Wow! Lots of great events to choose from! So many choices. Hard to choose just one.